**Please be sure to include all information before you submit. You can not update information once submitted and incomplete applications will not be considered. The Artists in Residence program offers affordable private and/or shared studios to emerging and mid‐range local, national, and international artists. Artists in Residence become part of a vibrant community of artists participating in Arts Warehouse programming, allowing for exchange and collaborative relationships to develop within the artist community. Space is awarded to applicants that best demonstrate their commitment to their practice, to experimentation and innovation in their work, to seeking artistic & professional development, and to being a part of and contributing to a dynamic community of artists and creative thinkers. 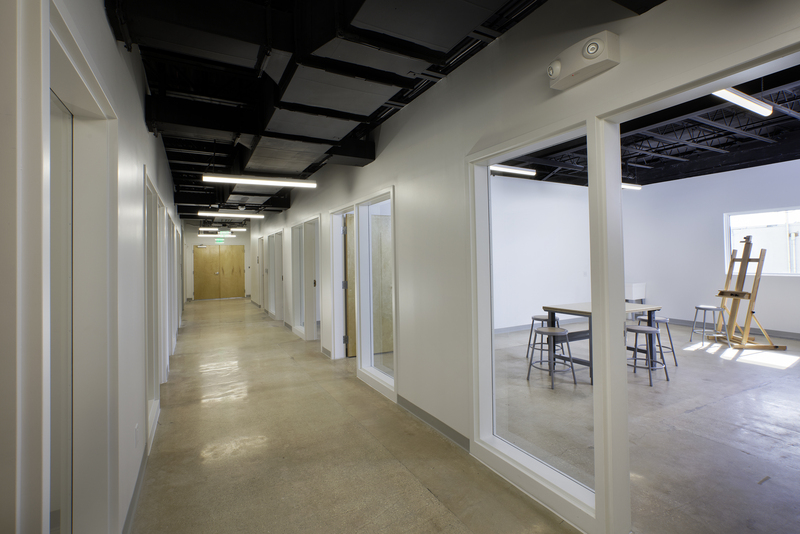 A.i.R leases include private and/or shared studios as well as access to flexible shared working space. Artists selected for this program range from emerging to mid‐range, and work in all artistic disciplines and media; including but not limited to creative makers, fashion, drawing, painting, artisanal florist, sculpture, photography, film, new media, installation interdisciplinary expression etc. Letter of interest outlining specific interest in working at the Arts Warehouse, how participation will affect the artist’s practice and career and a business plan summary. Documentation of recent work as described below. $25 processing fee (make checks to Delray CRA) and Background Check Form *this can be mailed in to Arts Warehouse or dropped off. 176 to 528 approximant sq. ft. studios. Spaces are appointed by Arts Warehouse staff for selected Artists. We will consider your preference in our appointments. 1 or 2 year leases with the prospect of renewable terms for a maximum of 3 or 4 years (all artists will be required to execute a lease for the space being provided and have reviews during residency and prior to renewal to determine continued eligbility) . Access to exhibition, teaching professional development opportunities, etc. Reviews/Update meetings with staff during residency and prior to renewal required to determine continued eligbility. Emerging to Mid‐Range professional, dedicated, working artists with a deep commitment to their practice and to advancing the mission of The Arts Warehouse. Artists must be U.S. citizens or permanent residents over 18 years of age. Artists working in most mediums will be considered. Artists working with toxic materials,hazardous machinery, etc. may not be considered due to limitations within the building. Artists must be ready to enjoy working in an open studio setting where the public is able to interact with the artist during public hours. Artists must work in the studio a minimum of 20 hours per week during public hours and First Fridays. Other times may be requested by the Arts Warehouse. Artistic merit of past and current work. Readiness to engage with and benefit from the Arts Warehouse Studio Program. Potential to further develop an innovative creative practice and impact the community. Arts Warehouse staff reviews applications to ensure completion and eligibility. Incomplete applications will not be considered. Submissions are reviewed by a committee of arts professionals in the community. The review committee changes yearly. The committee evaluates each artist’s materials and selects finalists. Finalists are invited for an in‐person or phone interview to determine final selections. It can take 1-3 weeks to complete the process. We do our best to complete it in the fastest way possible. A maximum total playing time of six (6) minutes. Video must contain a minimum of three (3)segments completed within the last two years. Label the video with artist name, title of work(s),date completed, medium, and full playing time. You may submit a link such as Youtube of yourvideo. *We do not put artist together. Artist may apply together and each should fill out an application but they should send submission together or you may request a shared space and we will provide an introduction but you will determine if there is a fit; both artist will be on the lease. If you are interested in a Shared Studio tell give us the name of the Artist who is applying that you want to share with. Please be sure to include all information before you submit. You can not update information once submitted and incomplete applications will not be considered.